This great gentleman once graced our presence at Boggo Road; he was a big man in so many ways that he deserves his place in our history. Tom was a young man with plenty of fight in him, but the war was to stop that and he enlisted as a gunner in artillery. He was taken prisoner by the Japanese and this was the start of this young man’s life as a Prisoner of War (POW) on the dreaded Burma Railway, for three years he survived the treatment from the Japanese. It would only get worse though, as he and many other POWs were transferred by ship to Japan as slaves of the Emperor. It was here in Japan that Tom witnessed the sky change colour as the atomic bomb was dropped over Nagasaki, and of course this would lead to Tom’s opposition against atomic warfare in future years. After Tom returned to Australia he ran some small family businesses and was convinced to have a look at becoming a Federal Politician for the Labor Party. 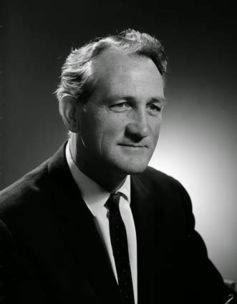 Tom was elected to Federal Parliament in the seat of Reid in 1958. He became a Federal Cabinet Minister under Gough Whitlam and served under Bob Hawke and Paul Keating, retiring in 1990 after 32 years in Parliament. Tom was the last and longest Second World War veteran to serve in the House of Representatives. He received a number of awards during his life, but it was not until 2013 that he was upgraded to Companion of the Order of Australia (AC) that set the party faithful and veteran community alight. The time was right and Queensland was the place for it to happen, yes it is October 1978 and Bjelke-Petersen’s dictatorial government was in power and ‘Pig Brisbane’ as it was referred to by southerners was a true police state. Three people or more could not march down the street, so street marches became the mode of the day for the freedom of its people. One of those marches had Tom Uren and Senator George Georges out in front sticking it to the Queensland Government. We all know the result; Queensland Police were ordered to arrest the leaders and any other fringe dweller of their choosing, Boggo Road Prison now became a ‘political prison’ for the Queensland government. This archaic rule was dumped sometime later as Queensland returned to mainstream Australia. It is said that Senator George Georges was lockup in the Herschel Street Watchhouse so many times, that he had his own cell and knew the Watchhouse keeper by his first name. 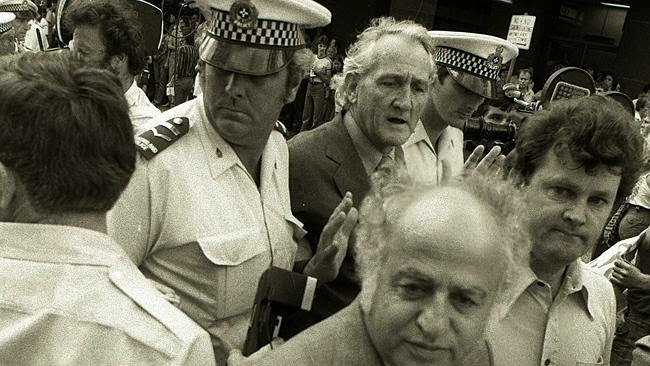 Tom Uren (centre) is arrested in Brisbane, 1978. Senator George Georges is in the foreground. I was one of many officers on duty on the day they bought Tom Uren into the Reception Division for processing; all officers were told not to salute Mr Uren. As the vehicle pulled up and Tom was ordered to stand in front of the reception window, I and many other officers saluted this man for what he stood for. The senior Prison Officers present could not stop the junior officers from saluting and speaking respectfully to Tom Uren, but the surprise was yet to come. The most senior officer present was the Chief Superintendent of Boggo Road Prison, Mr Clyde Lang, who was also a POW on the Burma Railway and a comrade in arms with Tom Uren. Later on that afternoon both Tom and Clyde left the prison to have dinner and no doubt drinks to their friendship from so many years ago. Tom received a surprise guest one afternoon in 2011; it was the Prime Minister of Australia, Julia Gillard, and she had arrived to inform Tom that a supplementary payment would be made to WW2 and Korea veterans as POWs. This was the one campaign that eluded Tom, and now Julia Gillard had done her part for veterans what no other MP could or would do. There are not many men who stand out among others and remain in the memories of those living, this is one such man that has left an indelible mark on so many.